While specific details of the deal to release Gilad Shalit have not yet been released, the general terms of the deal Hamas demands have been known for years. Hamas has made no secret of the fact that it was demanding that Israel free a host of arch-terrorists that were involved in multiple terrorist attacks and serving life sentences with no possibility of parole. A Hamas source said that the full list of terrorists to be released will be released later Tuesday night. Among them will be Arab-Israelis, and Arabs in Jerusalem, who are in prison for planning and participating in terror attacks. Until now, Israel has been opposed to including those terrorists in the deal. Among the terrorists to be released are some serving multiple life sentences – unnamed sources are suggesting that one of them is Marwan Barghouti, who was sentenced in 2004 to five life sentences for planning and carrying out the murder of five Israelis, and involvement in the murders of another 33. Among the terror attacks that Barghouti planned and participated in were a June 2001 attack in Maale Adumim in which a Greek monk was murdered as his beard made him look Jewish as he drove by the terrorists, a January 2002 terror attack on a gas station in Givat Zeev, a March 2002 attack at Tel Aviv's Seafood Market restaurant, in which three people were murdered, and a car bomb attack in Jerusalem. Israel has until now rejected the Hamas demand that Barghouti be released, but turned a blind eye to his ability to communicate with terrorists from his cell. Also on the possibly-to-be-released list is Ahmad Barghouti, a relative of Marwan Barghouti. Ahmad Barghouti in 2003 was sentenced to 13 life sentences for his role in murdering 12 Israelis. He, too, was involved in numerous terror attacks, including a shooting spree on Jaffa Street in Jerusalem in which two people were killed, a 2002 shooting attack in Neve Yaakov in which a police officer was killed, and an attack at the Maccabim checkpoint in 2002 that killed two police officers. Also likely to be on the list is Abbas al-Sayed, the mastermind of the infamous Park Hotel attack on Passover 2002. Thirty, mostly elderly, people were killed and dozens maimed and injured when a suicide bomber dispatched by Al-Sayed walked into the Park Hotel on the Netanya seafront in the middle of a Passover Seder. And, the list likely includes Ahmad Sa'adat, murderer of former Tourism Minister Rachamim Ze'evi. Sheikh Jamal Abu Al Hija, the commander of the military wing of Hamas in the Jenin, might be included in the deal as well, as might Hassan Salameh, one of the architects of the Munich massacre of Israeli athletes. Reports said Tuesday night that Gazans were taking to the streets to celebrate, distributing sweets to passerby and holding spontaneous anti-Israel demonstrations, where they were burning Israeli and American flags. Israeli observers said that the mood in Ramallah, by contrast, was dismal, as PA chief Mahmoud Abbas feared that the deal would strengthen Hamas' standing in PA-controlled areas of Judea and Samaria, at the expense of Abbas' Fatah terror movement. Yesha Council chairman Danny Dayan sent a letter to government ministers Monday evening in a last-minute appeal to them to oppose the deal. "We cannot release the terrorists who undertook these horrendous attacks, among the worst we have known, who murdered hundreds of Jews and who Israeli governments of all political persuasions swore would never be freed. Releasing these terrorists will further emphasize the total breakdown of Israel's ability to stand strong in the face of terrorism, and will bring about further kidnappings," Dayan said. MKs of the Land of Israel Lobby also expressed their opposition to the deal, saying that "we can already see before us the future victims of these terrorists." MKs Aryeh Eldad (National Union) and Ze'ev Elkin (Kadima), heads of the Lobby, said that "this is the moment of truth for government ministers, and we expect them to show strength of character in standing up to the pressures and reject this deal, that the Prime Minister himself had in the past explained was very dangerous," the two said. Families of victims of terror attacks by the terrorists who will be released in exchange for Shalit expressed, opposition to the deal. The Jerusalem Municipality's Committee for the Perpetuation of Terror Victims has announced that it plans to take action following the government's decision to sign a deal to release Gilad Shalit in exchange for terrorists. Attorney Yair Gabbai, who chairs the committee, said that after the deal is completed he will convene the committee he heads to make a decision that from now, all the city's memorial plaques in memory of terror victims will read: "The terrorist was released in the Shalit deal." The Hamas-run Al-Risala newspaper reported on its website on Sunday that Palestinian Authority-based terrorist groups may carry out another operation like the kidnapping of Israeli soldier Gilad Shalit. Abu Ataya, a spokesman for the Popular Resistance Committees, one of the three terrorist organizations which joined together to kidnap Shalit in June 2006, was quoted by the newspaper as saying the PA terror organizations have the ability to carry out a similar operation if they wish. "Shalit's kidnapping was not the first nor will it be the last," he said. "We will return the ball to our court when and where it will be appropriate, and in a way which will surprise everyone and especially the occupation." Meanwhile, a PA Arab commentator who is considered an expert on Israel, Hatem Abu Zaida, told Al-Risala that he believes the terror organizations will try to kidnap Israeli soldiers using other methods which Israel does not expect. He added that Israel would in the end be forced accept the terms of the kidnappers and release terrorist prisoners. Abu Obeida, a spokesman for Hamas' military wing, the Al-Qassam Brigades, refused to directly address his organization's future course of action regarding the kidnapping of soldiers, noting that "we will not provide the enemy with free information." At the conclusion of the article, its author expressed hope that there will soon be another kidnapping of soldiers. The article comes after last week, an official with the Palestinian Authority defended Hamas, saying it was not Hamas terrorists who kidnapped Israeli soldier Gilad Shalit. The PA's representative in Belgium, Leila Shahid, said during a joint meeting with Israeli representatives that it was a terror organization other than Hamas who kidnapped Shalit and transferred him to Hamas. Shalit, meanwhile, continues to be held by Hamas terrorists in Gaza and has not been allowed visits by the International Red Cross for the entire five years which have passed since his kidnapping. The organization recently called on Hamas to prove that Shalit is still alive. 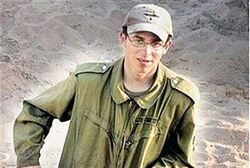 Earlier on Sunday, parents who have lost children to terrorist attacks called for Prime Minister Binyamin Netanyahu to release the names of terrorists that Israel would agree to release in exchange for Gilad Shalit. The demands were made following reports that Netanyahu has agreed to a proposal by a German mediator regarding Shalit's release.